Hemmick Beach is a pleasant sandy beach on the South Cornwall coast. There are no facilities and parking is limited. The walk down from the National Trust car park to Hemmick Beach can be very slippery after wet weather. No other details available. See Beach Safety Guide. There is a small parking area by the beach with level access to the beach. 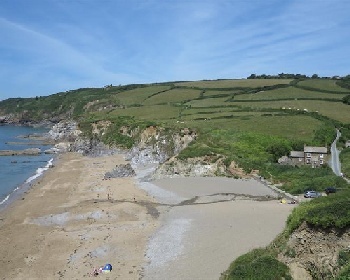 The National Trust car park is a 15 minute walk from the beach and the path is steep. Dogs allowed all year at Hemmick Beach. Hemmick Beach is 9 miles from St Austell. At St Austell, take the B3273 for Mevagissey. Shortly after Pentewan turn right for Gorran Haven and follow this road all the way to Gorran Haven. At Gorran Haven, turn right and follow this road for about a mile, then turn left and after a short distance the National Trust car park is after a bend. Continue on this road to park by the beach, but note that parking is limited. There is a small parking area by the beach with space for about 6 cars. There is a small National Trust car park a 15 minute walk from Hemmick Beach.